Reading books together as a family is the best way to connect. We connect with each other, with the books we read, and with the big ideas we encounter there. Do these four steps in your family, and you may find that your kids start to enjoy reading more than they ever have. They may start to pick up books more often in their free time, and to count your read-aloud sessions as some of their favorite family memories. This month at Read-Aloud Revival, we’re reading Snowflake Bentley by Jacquline Briggs Martin in our Premium Member Family Book Club. Whether you join Premium Membership or not (enrollment opens January 15th), we’d love to have you read along with us. Snowflake Bentley is an award-winning picture book that tells the true story of Wilson Bentley from the time he was a small boy in Vermont through his groundbreaking photographs of snowflakes. It’s an excellent book for all ages, and I want you to have our Book Club Guide so you can read along with us! I’ll walk you through the 4 steps of our Family book Club below, but first grab the printable version of this FREE Book Club Guide by popping your email into the box below. Success! Check your email inbox. Your Family Book Club Guide is on its way there now. This month we’ll reading Snowflake Bentley, the true award-winning story of the man who first photography snowflakes and awakened the world to their unique beauty. Written in lyrical text and illustrated with hand-painted woodcuts, this book is excellent for all ages. When you think about sharing an experience, the key is to keep it simple. I don’t mean go to the craft store and pick up supplies for an art project based on the story, or plan out a themed snack. You just want to offer your kids a memorable experience with the book– one that they’ll look back on fondly. Mix up some hot cocoa (don’t forget the marshmallows!) and read Snowflake Bentley. Take some extra time to admire Mary Azarian’s handprinted wood cut illustrations. Make sure to mention that this is a biography— a true story. For a little extra fun, get your own catalog of Wilson Bentley’s best 72 photographs in the Dover book, Snowflakes in Photographs. Our community is doing this on Thursday, January 24th, but you can do it any day you’d like! If you can, catch some snow crystals for a closer look. Set a dark piece of cardboard or foam core board outside to get cold for about 10 minutes before you begin. The smallest bits of snow are crystals—use your microscope to take a closer look before they melt. See The Story of Snow by Mark Cassino and Jon Nelson for more tips. Ask any of the following questions to spark a conversation. You don’t need to have literary know-how to do this. If you know how to ask your kids about how their day was, you know how to talk with your kids about books. What did Wilson Bentley want most of all? Who does Wilson Bentley remind you of? Which page in the book was most enticing to you? Was it the illustrations or the words on that page that drew you in? Or both? What surprised you about Willam Bentley’s story? What is something you don’t want to forget about Snowflake Bentley? If you got to pick one word to describe what this book is about, which word would you choose? (some ideas to get you started: snow, science, perseverance, curiosity) Why did you choose that word? On January 30th, your kids can meet the author of Snowflake Bentley, Jacquline Briggs Martin, in RAR Premium Membership. She’ll be live on video in Premium, answering your kids’ questions and giving us all a behind-the-scenes peek into creating Snowflake Bentley. You’ll need to join RAR Premium when we open enrollment January 15-21 in order to join us. I think you’ll be delighted by what happens when you share a book with your kids following these four simple steps. Read aloud. Share an experience. Talk about it. And meet the author. This is a magical recipe to nurturing family bonds and falling deeper in love with books. It’s simple. It’s meaningful. Maybe even unforgettable. I hope you read along with us. 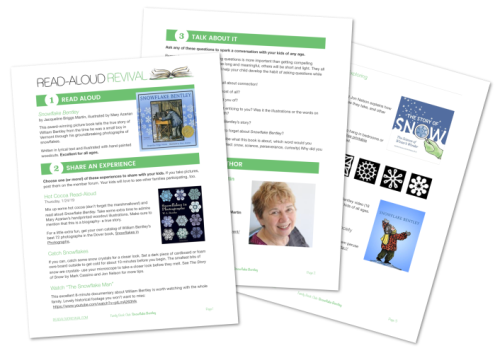 If you love it, you’re in the right place, and you’ll want to join us in Read-Aloud Revival Premium Membership. We have this much fun every single month!